Irish Garden House: Guess What . . .
Wasn't that a wild storm? Rumor has it that we will see a drastic warm-up next week. Such a crazy winter. Enjoy your approaching weekend! So pretty Lynne .... we haven't had any snow here yet. As much as I love it, we are not very organised in the UK for snow so, when we get it, everything comes to a standstill and chaos reigns !!!! Hopeless !!!! So it's probably better that we don't get any ! 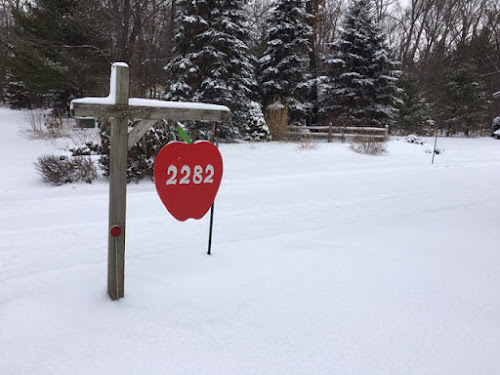 Wonderful wintry shots with the 'tucked in fence' and the neighbors red sign ~ Name must be Apple? Goodness sounds like you're experiencing a strange winter too! I like these wintry views! Oh my snow again....I feel for you. Let's see...what could their last name possibly be? Neat sign. a nice dose of it again! thanks, lynne! We got hit too. I put up some pictures today as well. Being in the apt we dont have to worry for doing driveways. The plow comes in and the Super out there. I feel bad for him. Yet we have had our share for centuries too. 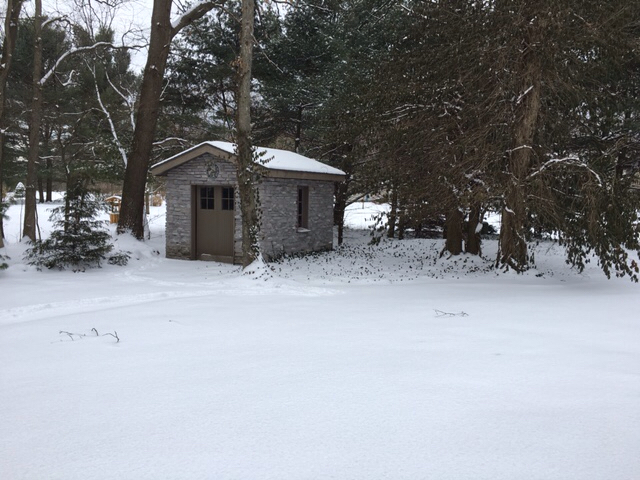 Nice photos Lynne but I want March nice weather more. It's snowing to beat the band right now. Nope, winter isn't over, spring is a long ways off and I'm tired and cold. I want sunshine and warm...pretty much...NOW! Your mom's flowers are beginning to come up! That just seems so unfair! I hope it melts soon and that you'll be seeing daffodils before long. I live that recipe for longevity! 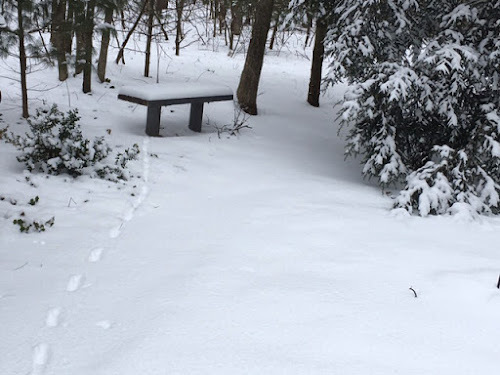 Enjoy the snow, if you can! It will be gone soon enough! I think this is the last of the snow. It is looking warm for the next two weeks, just a lot of rain, which in turn will bring flooding, nothing is ever perfect. I love that fence by the pines and what could be prettier than a pop of red in the snow! The postie couldn't miss their letter box! Love your snow pics Lynne! Uh oh! But it is pretty! We really have had a mild winter here with only 2 inches or less of snow so far. I say so far because we've still ample time for the weather to change, but I hope it doesn't!